*Image and book provided via NetGalley in exchange for an honest review. This book follows Keiko, an 18-year-old Japanese American whose father has recently died, leaving her with a one-way ticket to Japan, a camera and a note. In this note, her father tells her that her camera will guide her to where she needs to go. When Keiko finally sees something, it gives her a glimpse into another world with a dangerous kami trying to escape. She is rescued from one of the spirit's guardian dragons by Yui, her tour guide, who ends up actually being another spirit, the daughter of the Kami of Light and Spirit. Together the two search for a way to save the world from being destroyed by the dangerous kami that Keiko saw. I cannot say this enough, I love when a book doesn't go how I think it will go. I've read a lot of stories and many times I just hope for interesting characters that keep the familiar plot going. With Kojiki, however, I got interesting characters AND an unpredictable story. It doesn't hurt that, as I was reading and trying to figure out what was going on, so were the characters. I really like how Yatsuhashi handled the exposition, too. It wasn't just someone telling us all that had happened, we got to go into their memories and experience what happened. This is a great technique that kept me informed without being a boring exposition dump. It also helped to show how the characters have developed over the centuries and created empathy for several of them. Also, getting to experience the story from multiple narrators really helped to keep me informed about the motives for a character's actions. Yatsuhashi cites anime as a source of inspiration for him and you can definitely see it in this book, in a good way. Many of the spells and techniques he writes about are easier for me to visualize thanks to my own anime watching experiences. Nothing Dragon Ball Z style, though, don't worry about that. It's a lot more realistic...for being a book about elemental kami...and their guardians...and magic. I also really appreciated Yatsuhashi talking about the kami learning to use each others' elements via focusing on their own to the molecular level. That made Vissyus (the Kami of Fire) so much more dangerous. And the idea of trying to combine incompatible elements as a cause of a mind break was really interesting. The book isn't all action/adventure. There is a lot in this about daughters trying to get their fathers' approval. There is a love triangle between three of the kami. There is even a revenge subplot with the followers of one of the weaker kami. However, it is kept interesting by the fact that it keeps you wondering, as the author states, "...who is Kojiki's real hero?" In case you can't tell, I had a great time reading this book. 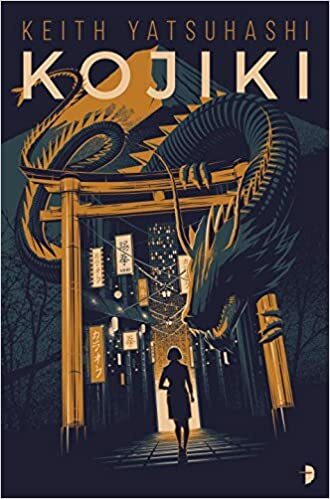 If you have an interest in anime style fights and/or plots, Japanese mythology, or fantasy elements in a contemporary world, I highly recommend Kojiki. This was a fun read that had me wishing I could create my own elemental shield or have my own guardian.